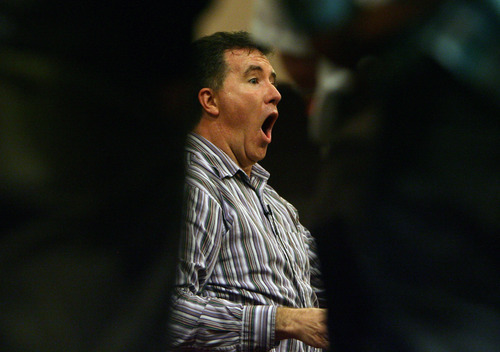 Music • Salt Lake Choral Artists concert mixes performers from two sides of the musical fence. 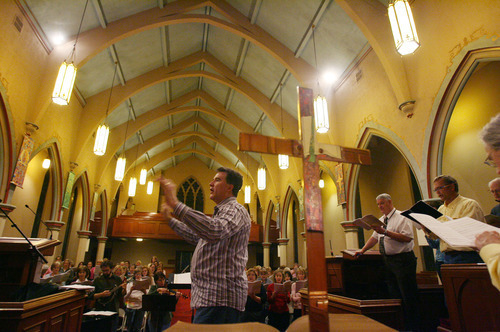 Steve Griffin | The Salt Lake Tribune Conductor Brady Allred leads the Salt Lake Choral Artists as they perform the Bluegrass Mass during rehearsal at the First Baptist Church sanctuary. Steve Griffin | The Salt Lake Tribune Conductor Brady Allred leads the Salt Lake Choral Artists as they perform the Bluegrass Mass during rehearsal at the First Baptist Church sanctuary. 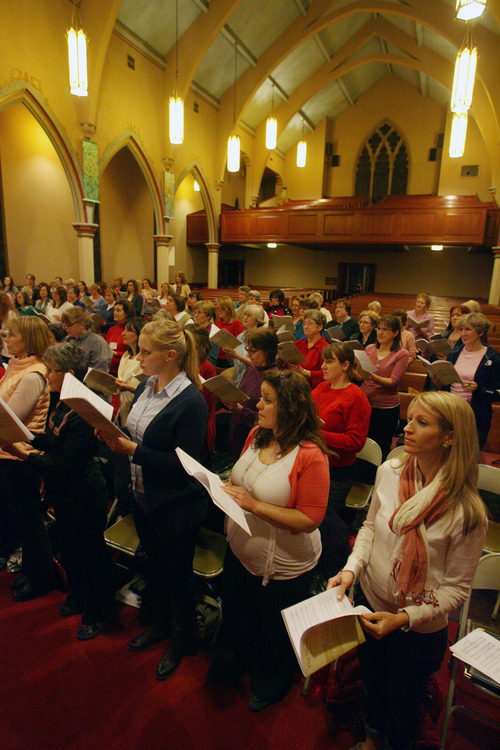 Steve Griffin | The Salt Lake Tribune The Salt Lake Choral Artists as rehearse the Bluegrass Mass d at the First Baptist Church sanctuary. Steve Griffin | The Salt Lake Tribune Conductor Brady Allred leads the Salt Lake Choral Artists as they perform the Bluegrass Mass during rehearsal at the First Baptist Church sanctuary. 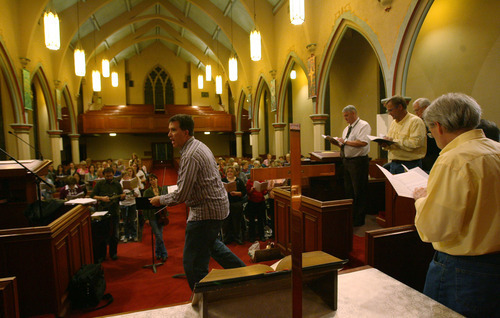 Steve Griffin | The Salt Lake Tribune Conductor Brady Allred leads the Salt Lake Choral Artists as they perform the Bluegrass Mass during rehearsal at the First Baptist Church sanctuary. Steve Griffin | The Salt Lake Tribune Otter Creek musicians Peter Danzig and Mary Danzig, play their instruments as conductor Brady Allred leads the Salt Lake Choral Artists as they perform the Bluegrass Mass during rehearsal at the First Baptist Church sanctuary. 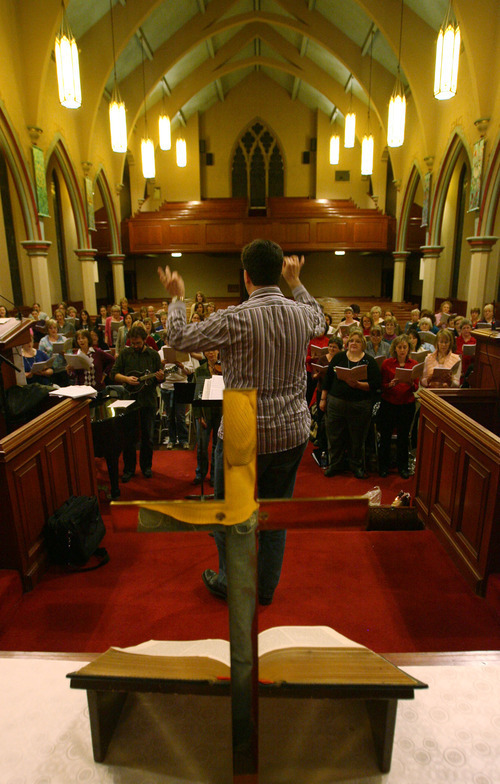 Steve Griffin | The Salt Lake Tribune Conductor Brady Allred leads the Salt Lake Choral Artists as they perform the Bluegrass Mass during rehearsal at the First Baptist Church sanctuary. 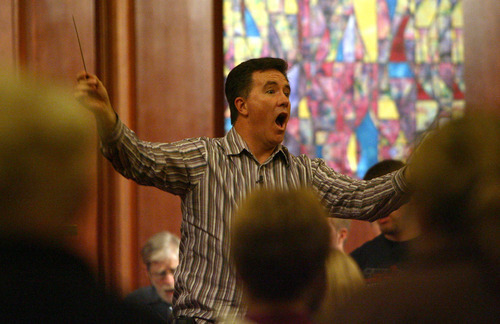 Steve Griffin | The Salt Lake Tribune Conductor Brady Allred leads the Salt Lake Choral Artists as they perform the Bluegrass Mass during rehearsal at the First Baptist Church sanctuary. 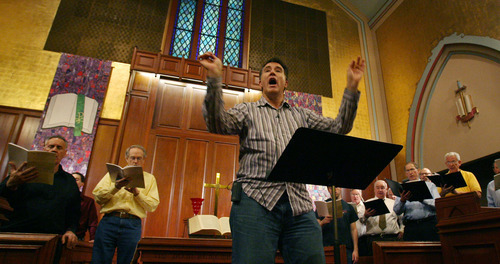 Steve Griffin | The Salt Lake Tribune Conductor Brady Allred leads the Salt Lake Choral Artists as they perform the Bluegrass Mass during rehearsal at the First Baptist Church sanctuary. Some musicians attend conservatories, perform in elaborate concert halls and cathedrals, and pride themselves on polished renditions of great masterworks, played note-for-note from the composers' score. Some pick out tunes by ear as they gather in parks and on back porches. They sing about their own lives and loves and pass their homespun musical traditions down through their families. Classically trained musicians sound wonderful. Folk and bluegrass artists are finger-picking good. Yet the two musical camps are known to hold each other in dubious regard, and too rarely find common ground in the field both love. "I started out with that same snobby perspective," said Mary Danzig, a classically trained violinist who became a fiddler. This week, Danzig is enjoying a rare chance to merge the two musical traditions she loves. Along with her husband, Peter Danzig, and other area bluegrass artists, she will be featured in Salt Lake Choral Artists' performances of Carol Barnett's "The World Beloved: A Bluegrass Mass." Mary Danzig's exposure to folk music started after she married Peter Danzig, a classical violist and folk-music aficionado who also plays many traditional instruments. Her epiphany happened when she heard top-notch bluegrass groups perform at a Snowbird festival about five years ago. "All of a sudden I understood what this music was about," she said. "It really just awoke this passion in me." Bluegrass music is blossoming among talented people who lacked formal training, but loved singing to their children, picking out tunes with neighbors and learning to play instruments as well as they could on their own, Danzig said. "There is something incredible about taking a tradition passed down from one person to another, and putting everything I have into it, just as I would if it was a classical piece," she said. "I don't just suddenly become sloppy when I play bluegrass. I honor the tradition of people who may not have had as many opportunities, by making their music be everything they were trying to create." SLCA music director Brady Allred said it wasn't easy to find musicians to play the fiddle, mandolin, guitar, banjo and bass parts for the unusual Mass performance. "I had to find the right combination of classical musicians that could read standard notation, but also play chord symbols and improvise," Allred said. The bluegrass players who assume the role filled by orchestra or organ in a typical Mass must read a written score, follow a conductor and count their way through frequent meter changes  "stuff bluegrass players don't do in normal playing," Allred said. And they must pluck and bow in the lively language of bluegrass, with all its jangling verve. The Danzigs and guitarist Rich Dixon, banjoist Nathan Keller and bassist Jim Thompson are musical bilinguals who are up to the challenge. 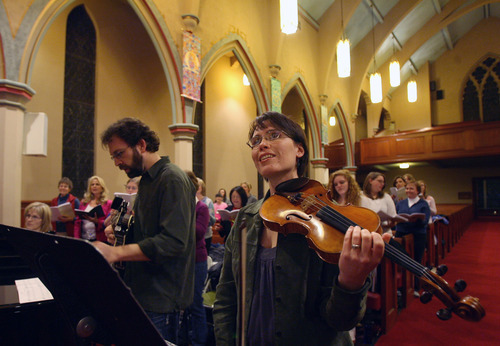 "['Bluegrass Mass'] keeps you off-balance in a really fun and unexpected way," Mary Danzig said. "Some aspects of it sound very much like traditional Appalachian roots music. Then it changes meter and goes on to some incredible choral sections from classical tradition. It keeps weaving in and out of these two worlds." Danzig and her husband perform and record together as a folk duo called Otter Creek, drawing upon their deep backgrounds in classical music to burnish their folk music performances. Mary was the 2011 winner of the Utah State Fiddle Championship; Peter won the Utah State Mandolin Championship and took second place in the National Mandolin Championship. Having been trained in note-reading from a young age, the most intimidating aspect of Mary Danzig's folk-music transformation was learning to improvise music on the spot. She now believes that classical music training programs err in not teaching improvisation. "Bach, Mozart and Beethoven all knew how to improvise," she said. "That's part of what a classical musician was supposed to be able to do." Learning to create music spontaneously has done more than make Danzig an award-winning fiddler. "It has helped me be a better classical musician," she said. "I have to pay attention to what the chords are and what the other instruments are doing. With the music in front of you, you can get away without doing that, but that doesn't make for the best music." 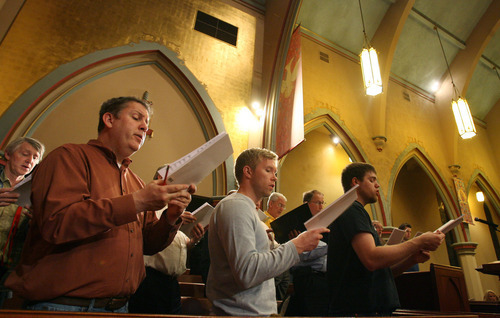 "Bluegrass Mass" has the same movements as a traditional Mass  Kyrie, Gloria, etc.  interspersed with folk ballads and instrumental interludes. Vocal solos and ensembles and large choral sections happen as they do in most Masses, but a down-home flavor permeates the work. Danzig said "Bluegrass Mass" is likely to please listeners from either side of the musical fence it strives to breach. Her comments echo those of Barnett, who wrote in program notes that she relished writing "cheery church music." "It has brought me back to memories of music heard while visiting my grandparents," the composer wrote. "Country music with a church flavor that told stories, and came out of a scratchy old record player. Grandma would not have allowed dancing, but under the table, I tapped my toes." The choirs of Salt Lake Choral Artists perform music of Appalachia. Guest artists are fiddler Mary Danzig, mandolinist Peter Danzig, banjoist Nathan Keller, guitarist Rich Dixon and bassist Jim Thompson. Conductors are Brady Allred, Jane Fjelsted, Joan Brinton and John Walker. Where and when • Friday, Feb. 24, at Park City Community Church, 4501 N. Highway 224, and Saturday, Feb. 25, at Libby Gardner Concert Hall, 1375 E. Presidents Circle, Salt Lake City; both shows are at 7:30 p.m.
Tickets • Salt Lake City: $20; $8 for students. :Park City performance: $10. Purchase them at the door or by visiting http://www.saltlakechoralartists.org.